No matter how skeptical we were from the very beginning the Apple Watch is everywhere now. You see them on the wrists of all kinds of people—not just tech nerds. It is officially a thing. And as of the Series 3 last year, it was even a pretty good thing that you could buy without feeling annoyed to hell by shortcomings. 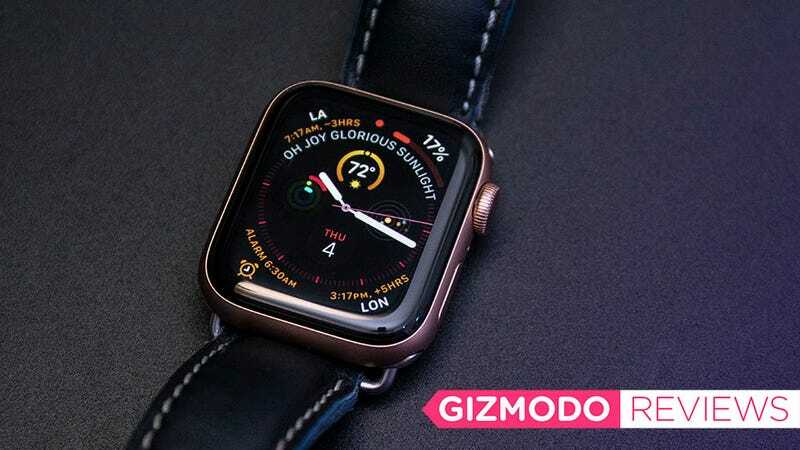 So where does that leave us with the Apple Watch Series 4, the device’s first major design overhaul since it was launched? Well, it’s a totally good, not regrettable thing, except bigger—and with bigger ideas that push the boundaries of how we think about wearable devices. The latest Watch--now with a bigger display! The display is actually very pretty and makes the Watch easier to use. Battery life has diminished and some of the coolest features aren't available yet. But first, it is literally larger. In going from Series 3 to 4 Apple popped in a new processor, improved the antennas, added a few more sensors and then sort of smooshed the watch down, so it’s now 0.7 mm thinner but its diameter is now 2mm wider. It results in a watch that is not obviously different. But there is no doubt that moving from a 38mm watch to a 40mm one has produced a much larger display that catches the eye and is infinitely easier to type on. (For the sake of clarity, this review regards the 40mm Series 4. A larger 44mm Watch is also available.) The new display has a resolution of 324 by 394 pixels. Up from the Series 3's 272 by 340 pixels. It’s also 34 percent bigger if you measure the display in square millimeters. That, coupled with the physically wider screen, leads to a display that just barely misses the edge of the case. The larger display means more information is visible at a glance in the new Infograph watch face, but more importantly, it makes it much much simpler to interact with the watch. More than once I found myself considering it to be a very tiny phone strapped to my wrist rather than a large watch. I didn’t entirely hate that! The display, as well as the addition of haptic feedback to the crown (it now clicks as you turn in), makes it much easier to navigate apps, menus, and other interfaces. The Series 4 (left) is thinner than the Series 3 (right). The Series 4 is instantly noticeable for its very different back. Even the Passcode screen feels less cramped. Yes, sometimes I’m struck by the intense annoyance that the best smartwatch available is something so unoriginal as a phone in miniature with a barely tweaked UI. But the new Infograph watch face is a step towards more thoughtful wearable design, using the restrictive nature of the watch’s small screen in creative ways to squeeze in more information. It isn’t as clever as Movado’s watch face last year that had existed for 70 years before the technology caught up with the designer’s vision, but it’s a start for the producer of the world’s bestselling watch, and a great way to help it differentiate itself from its larger actual phone cousins. But that big display has a downside, besides taking up the tiniest bit of additional real estate on your wrist. It’s gone and messed up the battery life. Using a Series 3 with cellular and GPS, I could get up to about a day and a half of life between charges (considerably more than Apple’s rated 18 hours). That’s not the case with the Series 4. It’s not that much less—maybe only three or four hours—but still noticeable. In real-life terms, this makes a difference to me since I go to bed with my watch to track my sleep. If I go to bed with the Series 4, it needs a charge before I can sleep with it again the following night. Meanwhile, with the Series 3, I could regularly make it through a second night before giving it a charge in the morning. Could I just find a few minutes to charge it in the evening before bed? Sure! But the point is that the shorter battery life has forced me to alter my habits. Mercifully, the watch’s display is so nice I’m wooed into forgetting my annoyance. I’m sure the health benefits will move me one way or the other—when they arrive. But those benefits aren’t here yet, and even when the features are fully deployed, it might be a long time before I need them. They’re part of an ambitious leap Apple seems to be trying to make. It wants to create a device that’s more intimately aware of your behavior and life than even your phone. One that replaces not just texts and calls or fitness apps, but WebMD and that one friend who worked as an EMT in college. 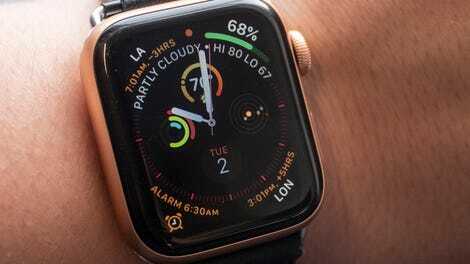 With the Series 4, the Apple Watch wants to be something caught between a simple fitness tracker with a heart rate sensor and a full-blown medical monitoring system. So far only one of the major new monitoring features is activated—at least theoretically. Apple repeatedly asked me to avoid testing the fall detection feature, which of course I ignored. I did everything from throw myself on a mattress at full speed, to lying on the floor and slamming my hand down in an approximation of a severe fall. I even tried a few stunt falls I learned in that one theater class I took in college. Nothing triggered it. The company claims it will only detect a fall when its measures very specific impacts on your wrists. The kind of impacts made when a person is falling and tries to catch themselves with their hands—usually injuring their wrists or other body parts in the process. The jury is still out on if I can claim Gizmodo workers comp for attempting the kind of falls Apple insists it can register so, for now, we’re stuck with Apple’s claims that the fall detection exists, and that it will activate a minute-long countdown when you fall. If you fail to disengage the countdown the watch will contact emergency personnel and your specified emergency contact. As someone with an older parent who lives alone, this is potentially exciting! Between this and the newest heart tracking feature (more on that below), the Series 4 has the potential to be a real boon to the enormous Baby Boom generation and/or their kids who live in another state and want to monitor their aging parents’ health from afar. This is nanny tech for people who are too old to want a nanny and too proud to accept one. The other big feature Apple touted when it announced the Series 4 is its ability to take an electrocardiogram (ECG) that can detect atrial fibrillation, an irregular heartbeat that can be fatal if left untreated. I’ve got a parent currently in AFib so I understand the appeal of such a feature. However, the ECG function is not yet available, and won’t be coming for a few months. As with the fall detection, the science of Apple’s new heart monitoring tool is shrouded in typical Apple secrecy. The Series 4 uses the built-in electrical heart rate sensor and a sophisticated algorithm informed by private studies commissioned by Apple. While it’s not accurate enough for a diagnosis, it could be a way to flag potential problems and get someone, like my stupidly taciturn dad, to the cardiologist ahead of problems. Again, the feature is not yet available on the watch so we have no way of knowing yet how accurate it is—though both the FDA and the American Heart Association have given their approval of the device. The fact that it isn’t activated at launch, despite the hardware being built in, should inspire a little wariness. So is the promise of better health monitoring in the future, as well as a faster watch with a bigger display now, worth it? If you’re a Series 3 owner then no, it is not. The three might be a hair slower and lack features like fall detection, but its lower price and longer battery life means its still plenty appealing. But if this is your first Apple Watch, then the Series 4 makes much more sense. Apple has, for the most part, improved on what is still the best smartwatch you can buy. It’s bigger and gets less battery life on a charge than the Series 3. It’s also an exceptional watch, and the large screen makes it easier to navigate around the Apple Watch. If you have a 3 don’t bother with the upgrade, but owners of older Apple Watches, or people eager to try it for the first time should check the Series 4 out. One of the neatest features, ECG, is not yet available. Fall detection was not tested due to the potential for bodily harm.